"When worn this piece sparkles with the movement of the wrist, when off the body it appears as if it is floating in space." "We had one in our garden for many years; this beautiful tree not only gives us a brilliant colour display in Autumn, its flowers are spectacular during the Summer too." "A study of the life cycle of insects in violet and pink." "A colourful twenty four hour day!" "The rotating spiral containing clusters of stars." "I found a single seed among the lentils; its ridges were deep and patterned, perfect geometry in miniature." "The loosely tied threads create an atmosphere of mystery." 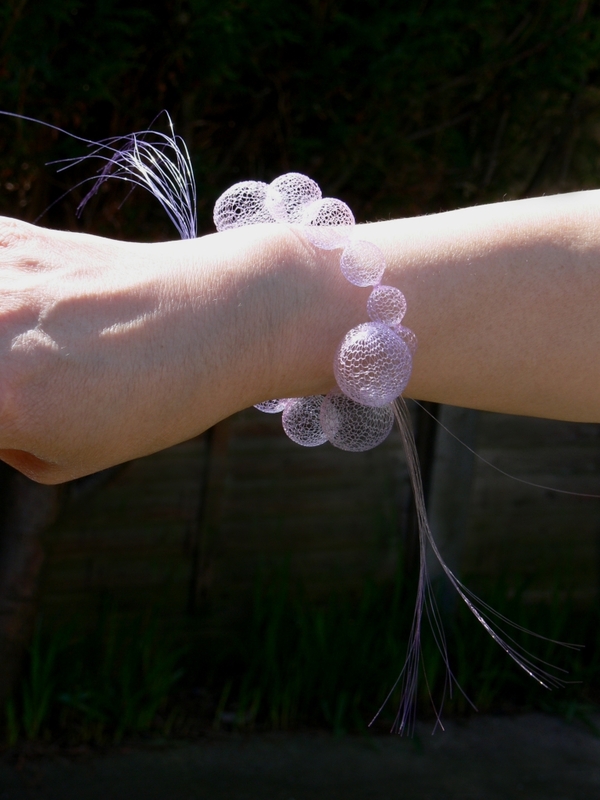 A knitted torus twisted to fit the wrist. Black pearls add sparkle and a touch of contrast." "The humble peanut has worked its magic on me." "The 1969 moon landing when astronaut Neil Armstrong took the photograph of the Earth from the moon -- it was magical!" "I was playing with the idea of the Elizabethan style ruff. I used the figure eight motif, suggested by the side of the ruff, as the idea for bending my woven loop ribbon into a continuous irregular figure eight pattern for my collar." "One of my favourite flowers, its overlapping petals formed the structure of this neckpiece, which retains the spirit of the flower." "Like sunken amphorae, urn shaped ascidian only an inch and a half tall placidly filter plankton from the sea." 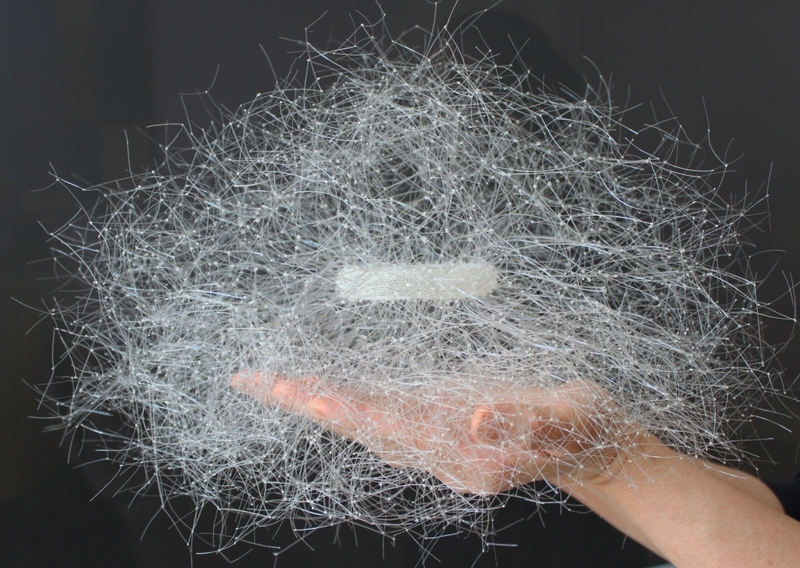 Nora Fok meticulously fabricates jewelry from pigmented nylon monofilament as well as Linlon, Fok’s term for linen and nylon monofilament mixed thread developed by the artist with a grant from the Arts Council of Northern Ireland. 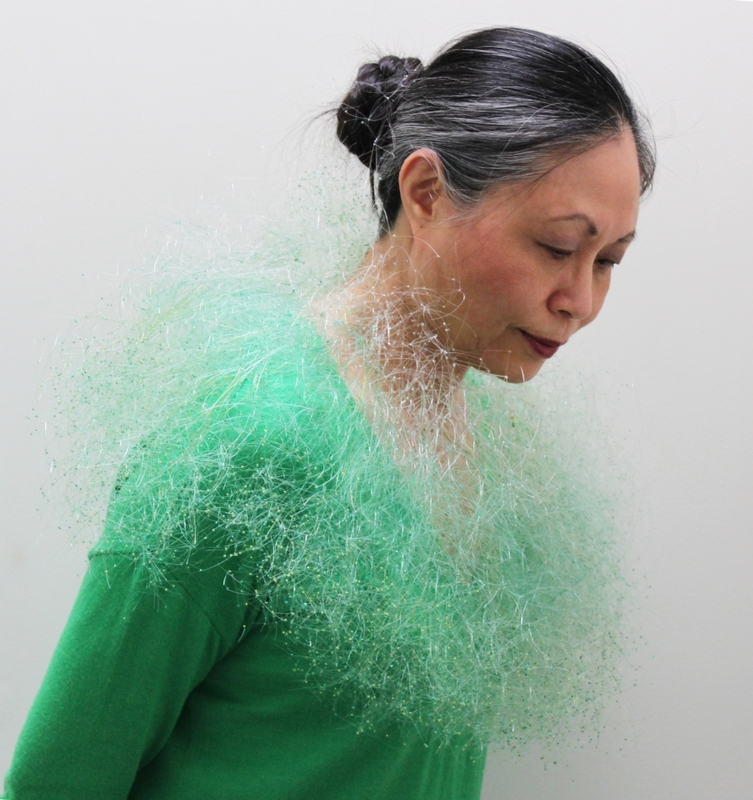 Using a variety of textile techniques, the work is knitted, knotted, woven, tied and looped into necklaces, earrings, rings, and bracelets: ethereal dream-like wonders that evoke fragility, despite sturdiness and wearability. The presence of natural botanicals, found objects and even mathematical problems is the inspiration for her work. Fok is a recipient of the prestigious Jerwood Applied Arts Prize (2007) and her work was most recently exhibited at The Mint Museum in North Carolina as part of the exhibition, Body Embellishment, where she hosted workshops and lectures. Her work was also featured at the Racine Art Museum as a part of the exhibition, (in)Organic. Most people think of linen as a woven material of fine quality. Linen cloth has been in existence for thousands of years and was considered by the Egyptians as a noble material. I had never used linen as a material in my work before, so I did a lot of research, and grew some of my own as an experiment. I studied the processing techniques, then tried twisting the flax fibres to make linen threads by hand. My aim was to explore possibilities of using this natural vegetable fibre. I used all parts of the flax to highlight the versatility and beauty of this plant. I also mixed linen yarn/fibre with fine nylon to give linen a “body” for wearable adornments and sculptures.